To burn a beeswax candle is to enter into the wisdom world of the bee, and you enter, too, into a world of benefits from the bee. Compare this to breathing toxic fumes from paraffin candles! (For more on toxic candles, see Candle Soot. Make sure to only buy 100 percent pure beeswax candles. Choose yellow beeswax (it is lightly refined)and not white beeswax is often bleached with chemicals and is best avoided. Love the scent and warmth of these delightful candles and love to bring them home-a few were not burned because the design was so lovely. 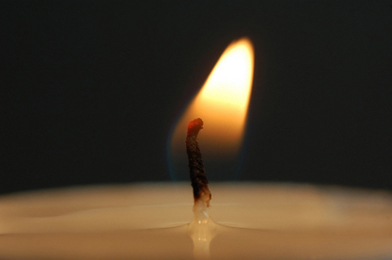 As it turns out , beeswax candles aren't the only negative ion producing fuel known to mankind. But does produce more negative ions when burning compared to paraffin. Thank you Annie! I love beeswax candles and I love to make them from leaves of pure beeswax with a honeycomb pattern. These leaves are put into the beehives. Beeswax candles are ideal for meditation and there is a sacred and sweet feeling of watching them slowly burn. IMPORTANT: keep the fuse short for optimum burning of the candle. Other then all the spiritual stuff this was a pretty interesting article. I think I'll switch over to beeswax candles!